Hayden High School junior Hunter Rummel is one of the Tigers' returning leaders who qualified for the Class 2A state championships in Denver last winter. With athletes like Rummel and seniors Tanner Guire and Taylor Lewis, Hayden is looking to take care of some unfinished postseason business in 2014-15. Hayden — In the far tucked-away corner of the Hayden High School gymnasium sits the Tigers’ wrestling facility, and inside music blares at the packed room with one team working toward one goal. What is Hayden most excited for this winter on the mat? “Finishing,” coach Chad Jones said without hesitation. A glance at the Tigers’ roster shows that, at least on paper, they are more than capable of finishing the deal and qualifying another wealth of talent to the Class 2A state championships in Denver. But even after a 2013-14 season that saw four state contenders move on to that 2A bracket, there still is an aura of unfinished business in that Tigers wrestling facility. Hayden ripped through much of its regular-season meets and tournaments last winter only to post a relatively subpar performance at the 2A Region 1 meet, placing seventh out of 13 teams. The Tigers graduated just one of their state meet qualifiers in Journey Vreeman, who Jones brought back this season to help coach his former teammates. 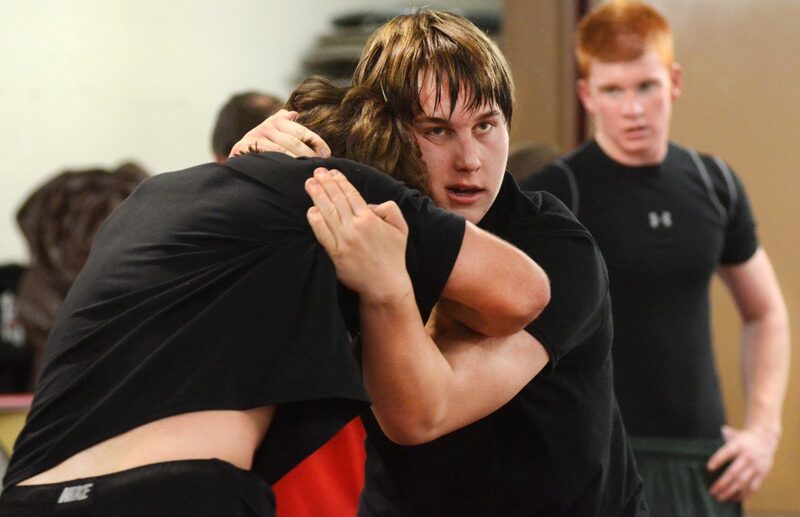 Working in Hayden’s favor is some deep holdover leadership from the likes of seniors Tanner Guire (126 pounds in 2013-14) and Taylor Lewis (185 pounds in 2013-14), who got to Denver’s Pepsi Center in February with now-junior 220-pounder Hunter Rummel. Alongside that group is a host of underclassmen, too, who came on strong last winter, athletes like Tommy Wade, Christian Carson and Judd Magee. Jones will get plenty of contributions from other wrestlers like Jake Planansky, Brennan Guire, Koa Cash and Tate Montieth. Former Moffat County wrestler Devlyn Mosman will be an asset at 120 pounds, Jones said, when he’s available after sitting out half the season per transfer rules. As deep as Hayden is this season — by far the deepest squad in Routt County — Jones said the region won’t deal up any gimmes, just like it didn’t last year. With dominant programs like defending state champion Paonia and third-place finisher Meeker once again on the docket, Class 2A also welcomes former Class 3A schools Cederedge and Hotchkiss, making an already deep region even deeper. Lewis, one of those senior leaders, stressed bringing the younger guys along as the team enters a long and tough season, which kicks off Dec. 6 at the Middle Park Invitational. Get the young ones to buy in, the Tigers believe, and 2014-15 could prove to be the finishing statement Hayden started this time last winter.